This 'trade' ad from early 1969 is kind of like the Rosetta Stone... the key to understanding where Chips Moman and American were at during this period. If you notice, Tommy Cogbill has been promoted to the 'Executive Board', along with Chips and Don Crews. He had pretty much put down his bass by then, and Mike Leech (who, according to Papa Don, could "imitate Tommy's style to a T") had taken over. Dan Penn had finally convinced Spooner Oldham to leave Fame and join him at American in early 1968. 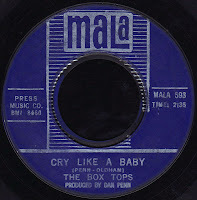 They put their heads together and came up with yet another smash hit for Alex Chilton and the Box Tops, Cry Like A Baby, which spent almost four months on the charts, including two weeks at #2 Pop (only kept from the top slot by Otis Redding's Dock of the Bay!). Despite that fact (or, as we've seen, maybe because of it), there was no room on the Board for Penn. Instead, he's listed along with Oldham as one of the staff songwriters for what must have been their in-house publishing company, Press Music. Penn told Guralnick that by mid 1969, Chips told him "Get in or get out" to which he replied "I'm Gone," and opened up his own studio, Beautiful Sounds, which apparently never amounted to much (a fact which Dan attributes both to the assassination of Martin Luther King, Jr. and the arrival of marijuana on the Memphis scene...). In any event, Chips had succeeded in driving him away. Cogbill became his new production partner, and a record they cut on a Seattle folk singer busted things wide open in the summer of 1968. 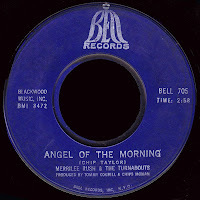 Although Angel Of The Morning only hit #7 on the US charts, it apparently made number one in seven foreign lands. 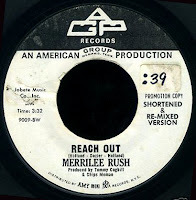 It was huge, and the possibilities seemed limitless for Merrilee Rush and her band The Turnabouts. Chips used his new found leverage with Bell to establish his own 'American Group Productions' and get them to place his AGP logo on future releases. 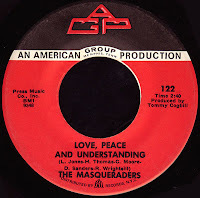 In addition to providing back-up vocals for most everybody from then on, The Masqueraders were also excellent songwriters, and quickly became a part of the team. 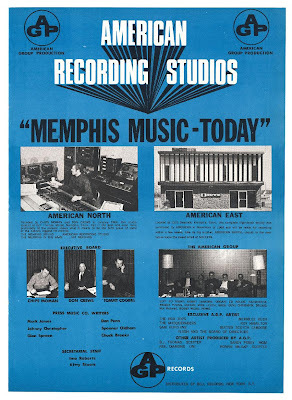 With Tommy Cogbill as their producer, their first Memphis efforts were leased to Wand up in New York (who had become one of American's best customers by then), an arrangement that Larry Uttal wasn't too happy with. He would release their next single himself on Amy, only he had to change their name to Lee Jones and the Sounds Of Soul. In any event, after one more Wand 45, he got his way, and signed them to Bell. 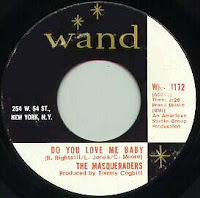 It turned out to be a pretty good deal, as it gave the Masqueraders their first chart hit after literally years of trying. I Ain't Got To Love Nobody Else would make it to #7 R&B in the fall of 1968, and spend over three months on the charts. With 'AGP' appearing on the label in letters as big as 'Bell', it set the stage for what Chips had wanted all along, his own record label. Jerry Wexler has made no secret of the fact that he was pissed off that Moman didn't choose Atlantic as his distributor (after he had loaned him the $5000 to upgrade American's equipment), and went with his nemesis Uttal instead... a fact which no doubt helped set in motion Wexler's exodus to Criteria in Miami later on. 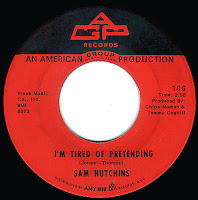 One of the first artists to record for the new label was Sam Hutchins. The Masqueraders had met Sam back in their home town of Dallas, and just loved his voice. 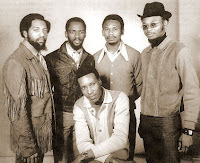 He had been traveling with the group as an opening act at their performances, and when they got to Memphis Chips was impressed as well, signing him as a solo artist. 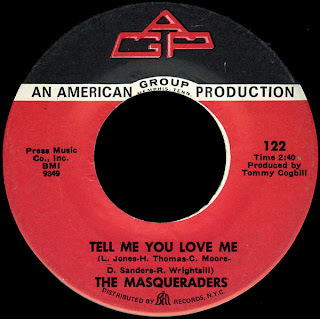 After one release on Mala, he would cut two great singles for AGP (one of which is now up on The A Side), with the Masqueraders providing both the material and the back-up vocals. 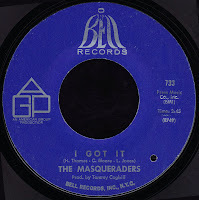 The AGP roster included some colorful characters, like football great Roosevelt Grier, who would record some Masqueraders penned material for them, as well as fabled vocal group The Ad-Libs, who had the inaugural release on the label. Mark James (the 'Press Co.' writer who had given Suspicious Minds to Elvis after his own version of the song went nowhere) would produce local garage legends Butterscotch Caboose for them, and Chuck Brooks, who would go on to create some great records with Homer Banks and Randy Brown, cut one of AGP's most sought after releases, I've Got To Get Myself Together. 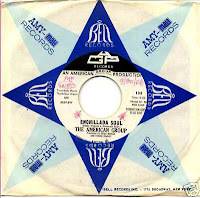 There would also be three singles by The American Group themselves, including the way cool Enchillada Soul, which was penned by Bobby Womack and our man Rosy Grier(!). As the only recordings this great band made under their own name, these 45s are next to impossible to find and, when they do show up on eBay, go for big bucks (a situation which will probably get even worse now that I've opened my big mouth!). Oh well. If you take a look at the 'American Group' photo from the Rosetta ad, you'll notice a member of the band that never seems to get mentioned, Ed Kollis. As the studio's official harmonica player, he's featured on some great records (Joe Tex's Skinny Legs and All comes to mind). I wonder whatever became of Ed? I'm not sure what kind of deal Moman made with Uttal, but it seems pretty amazing that the larger company consented to let AGP handle future 'product' on one of its hottest stars at that point, Merrilee Rush. After her follow-up on Bell only made it to #79, she became an AGP artist, with only one of her four singles for the label cracking the Hot 100. I don't know if Bell was actively 'selling' AGP releases, or what, but it sure doesn't seem that way. Another unbelievable signing that AGP made was R&B great Roy Hamilton. 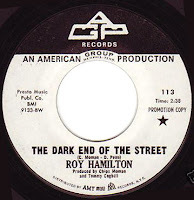 His legendary cover of Dark End Of The Street just drips with Soul but, predictably, none of his three AGP singles made much noise. 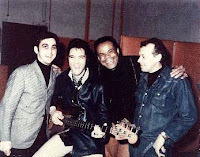 Roy was recording at American at the same time as Elvis, and they split the sessions, with Hamilton cutting in the morning, and Presley in the afternoon. Imagine? Sadly, Roy died in New York shortly thereafter due to complications from a stroke. He was only forty years old. I'm not sure what happened after that, but AGP ceased to exist as a label by early 1970, after only 26 releases. It could be that Bell (who chose to record new signee Solomon Burke at Fame in 1969) had moved on by then, I don't know. By 1971, though, Atlantic was no longer a client, and Chips was becoming increasingly aggravated at what he saw as a lack of appreciation there in the Bluff City. After something called the 'Memphis Music Awards' completely ignored his studio and its unparalleled string of hit records two years in a row, he couldn't take it anymore, and he closed American down for good in 1972. You see those two little pictures up there? As far as I can tell, they are the only photographs that exist of this landmark studio. The color one was taken in 1985, after most of the letters had fallen off of the sign. The building was demolished sometime in the nineties, and 827 Thomas Street is a litter-strewn vacant lot today... what a shame. You know, when you visit Memphis, it's hard not to notice the busloads of tourists that Graceland ferries over to Sun... and, after seeing what Stax has done with a rebuilt facsimile of their own bulldozed studio, it's not much of a stretch to envision an 'American Museum' on the corner of Chelsea and Thomas. The Elvis traffic alone would pay the bills. Now, wouldn't that be something? I'd be their first visitor! Nice one TY went to see Dan Penn show last night was great! "When I first left Florida in 1970 and went to Memphis we did our first demos at Chip's American Thomas Street Studio. Ed Kollis, in fact was our engineer.. Chips had "gone fishin" (sign on the console). Ed has been a lifelong friend and currently lives in Nashville. Ed comes to Playground about once a month, mostly on his motorcycle in good weather. I have him play his harp on most everything as he is one of the most unusual players ever. "For those interested There is a new Wiley and the Checkmates CD coming out in April sometime on the Rabbittfactory label that we recorded at Playground last February that ED is playing on as well as the incomparable David Adkins from Dothan (who was a key member in the first Playground Rhythm section). This a very decent soul record. "Ed was on the 'Elvis in Memphis' records that they did at American in 1969 and I believe was credited for producing on the Dusty Springfield record (even though she sang her vocals in New York). I'll tell Kollis that you were asking about him..."
Red, I'd be the second visitor! Chips and American Studios deserve so much recognition. It just does not make any sense, the way their incomparable contributions have gone pretty much unheralded. I'm looking forward to the book about Chips and I appreciate any stories & history I can find that music lovers can sink their teeth into. This is true music history - and the fact that Chips has been ignored and passed over for awards & recognition just HAS to change. I appreciate all the information you share. Ed Kollis is alive and well in the Ft. Walton Beach area of Florida, playing in a band called BigWater. He played a couple of gigs with me here in Huntsville, Alabama this past weekend, and sounds great. Actually, part of the reason why Bell was no longer issueing any AGP material was because Bell had become the flagship label for Columbia Pictures and Screen Gems Television by late '69--Amy and Mala had been shut down while the company's main focus now was a brand new PREFAB group - The Partridge Family--Bubblegum smells but it also sells!! Very interesting... I hadn't realized that. Do you know if Larry Uttal was still involved with the label at that point?